In 1724, 54 men out of the approximately 250 people living in the area then known as Charlestown End petitioned to become a separate town. Part of the 1725 agreement creating the new Town of Stoneham was to make provision for a meetinghouse (church), minister, and schoolmaster. The newly-formed town bought land for the meeting house and burying ground from James Hay in 1726, who donated more land in 1758. For over 100 years, the Old Burying Ground served as the only burial place in Stoneham, and it was during this period that it received a majority of its roughly 350 interments. The first burial recorded was of Timothy Wright in 1728. Since Stoneham was settled by the English in 1645, there were deaths and burials within town limits before 1728, but the location of any graves is not officially recorded. Some were likely buried on their farms or in the Burying Ground in Wakefield (then Reading) as that is where they attended religious services. ​ Many poorer inhabitants did not have stone markers and their exact grave locations are unknown, as are the burial spots of Native Americans, slaves and free blacks. The OBG holds the remains of many of the Town’s founding families, and nine families account for 55% of headstones. They are Gould (45 headstones), Green (42 + a tomb), Hay (24), Richardson (19), Bucknam (15), Bryant (14), Vinton (13), Hill (11 + a family tomb) and Lynde (10). It also contains the graves of soldiers from the French & Indian War (3), the Revolutionary War (31), the War of 1812 (3) and the Civil War (2, one of whom was an army nurse). There were also a number of unmarked burials of free blacks, slaves and Native Americans, as well as those too poor to buy a stone grave marker. 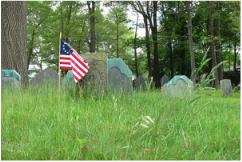 Burials began to slow when the Town established the Stoneham Cemetery (across William Street) in 1844, and the Garden Movement-style Lindenwood Cemetery in 1861, which holds the graves of most civil war veterans. After the opening of the two larger sites, less than 40 interments took place at the Old Burying Ground. The last recorded (and only 20th century) burial took place in 1924. The William Street Cemetery was closed at the end of the century and most graves were moved to Lindenwood. ﻿The kinds of symbols and images used on gravestones changed over time, but there were common patterns. 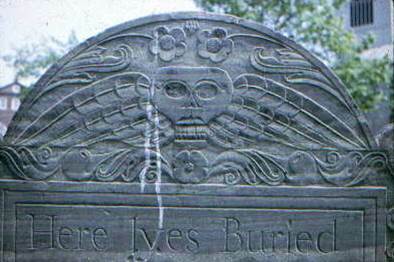 The earliest was the "death's head" or "winged skull" style (late 1600s through circa 1780). Carved gravestones were a compromise to the typical Puritan hostility to anything that could be considered idolatrous. However, the death’s head would have been a graphic reminder of human mortality. Death’s heads gave way over time to a "cherub's head" style (circa 1760 through 1810), as orthodox Puritanism softened in the 18th century. Cherubs were in turn displaced by a preference for the "urn and willow" style (circa 1770 through mid-1800s). Both remained common symbols of death and mourning into the 20th century. The Town of Stoneham maintains the Old Burying Ground, but that only includes small amounts of landscaping. In 2012, the Town commissioned an Historical and Engineering survey of the OBG. While the majority of markers in the cemetery are stable, 102 markers (65 headstones and 37 footstones) require conservation treatments because they are broken and in disrepair. The primary consideration, however, is safety, and 40 of the stones are considered structurally unsound or hazardous and in need of priority restoration. 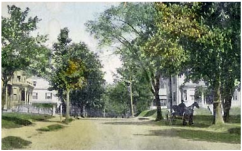 The Stoneham Historical Commission is seeking funds needed to preserve and protect these stones of our civic ancestors. Further to the east on Pleasant Street lay the original town center, on the other side of the then-open Sweetwater Brook. It held a small common, the original Meeting House (church) and school for the Town. At the time the Burying Ground was opened in 1726, you would have been able to see the Meeting House and School on the hill around the corner on Pleasant as the ground was cleared. The East School (built in 1851 and used as a school until 1939) is also about two blocks east from where you are now. On your right, you can also see the complex that currently holds the YMCA that was originally built as a cardboard box factory that supported the town's large shoe industry.